And how our rush to lock up immigrants has overwhelmed the federal prison system. The Willacy County Correctional Center in Raymondville, Texas, is now empty. As of late May, a single security guard sat in a small car in the entrance to the parking lot. It has been like this since prisoners so ransacked the facilities in a February riot, cutting and burning holes in the Kevlar domes that held them, that the Federal Bureau of Prisons declared it “uninhabitable.” The agency moved the inmates to other prisons and declined to renew its contract with the private corrections company that ran the facility. Nearly all of the 400 employees were terminated. Willacy’s operating company, Management & Training Corp., says the riot was plotted by inmates and was unavoidable; the SWAT team it deployed to control inmates, a measured response to prisoner unrest. This version of the story, which has circulated in the press since the days after the riot, is at best a partial truth, and one that obscures the company’s own aggression. A fuller account of the events at Willacy points to deep problems with the federal government’s management of a soaring population of immigrants it incarcerates for border crimes. Until it was closed, Willacy was one of 13 low-security facilities in the federal system that held noncitizens serving the final months or years of their criminal sentences. The more than 25,000 men held in these facilities, called Criminal Alien Requirement (CAR) prisons, are later transferred to immigration authorities and deported. The facilities are not immigration detention centers; they are criminal prisons. But they differ from other BOP facilities in key ways. They are all privately operated. They offer fewer programs, less permanent housing, and often have a smaller—and lower-paid—staff. The BOP has said that immigrants are an “appropriate group for housing in privately operated institutions where there are somewhat fewer programs,” because the inmates aren’t being reintegrated into US society. One measure of that inequity is that riots keep breaking out. 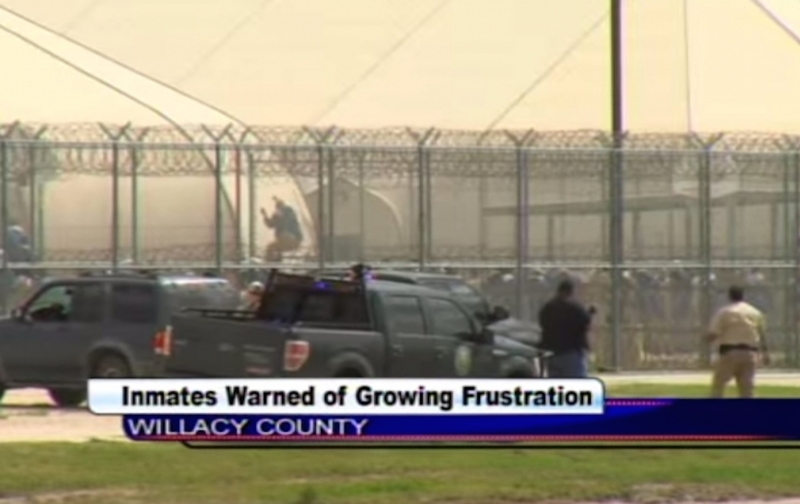 Willacy’s riot was the fourth at a CAR prison since 2008. The BOP’s other low-security prisons, by contrast, almost never experience such eruptions. The Justice Department Inspector General released a report in April that found that a CAR prison operated by the GEO Group in Pecos, Texas, where prisoners rioted in 2009, had for years had understaffed medical and correctional units and failed to address known inadequacies in security and healthcare. In 1992 federal courts convicted just 690 people of illegal reentry. By 2012, the number of federal convictions for illegal reentry had grown to 19,463. MTC has said that a small group of prisoners at Willacy used medical-care complaints as a pretext to orchestrate the February riot. According to this version of events, the inmates feared for their safety at the border crossing through which they were to be deported. MTC says the inmates rioted so that they would be moved to a different prison and thus would be returned to Mexico through safer crossings. In May, I interviewed 15 former staff members at Willacy, many of whom were on the front lines the morning of the riot, as well as three inmates who were incarcerated there at the time. All the witnesses I interviewed challenge MTCs claims. They say the prison leadership, not the prisoners, sparked the riot; what had been a peaceful protest over prison conditions turned violent only after officers used tear gas, as well as rubber bullets and exploding BB-filled grenades against a group of prisoners. A member of a law-enforcement agency that was present after the riot said this account is “consistent” with the one that the agency pieced together. The conflict in Willacy began around 8 pm on Thursday, February 19, when the inmates initiated a work strike. “We made the agreement that we would not leave the units, and that nobody would do anything,” an inmate told me. Ricardo Garza Jr. had worked as a correctional officer at Willacy since the prison opened, in 2006, as an Immigration and Customs Enforcement detention center. In 2011 ICE ended its contract with MTC, but a month later MTC received another $532 million 10-year contract to transform the facility into a CAR prison. Garza was hired back. I talked with Garza in May, at his small Raymondville home. Garza, like most of the former officers I spoke with, was still unemployed, and hoped the prison would reopen. Correctional officers there earned nearly $15, a high hourly wage in Texas’ Rio Grande Valley. As the sun rose at 7 am, officers who were stationed inside the pods on the next shift recall, the atmosphere was still unusually quiet. They too were told the inmates were conducting a “sit-in.” “All of them were peaceful, they weren’t messing with the guards,” said one officer who was in a pod that morning. All the officers quoted, except Garza, asked not to be identified, because they hope to be hired back if the prison opens again. Because the ratio of correctional officers to inmates was low—a common complaint among the staff—officers say that they relied heavily on the inmates’ own organizational hierarchy to secure the facility. The Paisas—short for paisanos, or “fellow countrymen” in Spanish—is a hierarchical group that operates in many federal prisons. Federal officials call it a gang; at Willacy, it was practically an administrative partner. In typical federal prisons, with more racially diverse populations, the Paisas do actually function like any other prison gang—primarily, providing protection against other groups. But Willacy was not an ordinary prison. As of late 2014, 85 percent of Willacy’s 2,658 inmates were Mexican nationals. Some were convicted of crimes like transporting drugs or burglary. But, according to federal records, seven in 10 were incarcerated for immigration-related crimes, mainly “illegal reentry”—meaning they had been caught crossing the border or in US territory more than once, or caught returning after a previous deportation. Two decades ago, many of these men would not have been in prison. In 1992 federal courts convicted just 690 people of illegal reentry, according to figures from the Pew Research Center. Border crossing was treated only as a civil offense, not a crime. Crossers were deported, but rarely prosecuted and incarcerated. In the last 20 years, as Congress has tightened criminal laws on the borders and federal prosecutors have shifted attention to the southern border, this has changed. By 2012, the number of federal convictions for illegal reentry had grown to 19,463. The average sentence is two years, but the charge can carry sentences of up to a decade for people with previous state or federal convictions. A Homeland Security Inspector General report in May found no evidence the government’s reentry prosecution program deterred border crossings. But the prosecutions have helped make Latinos the largest ethnic or racial group in federal prison. With a nearly homogeneous population, most men inside CAR prisons automatically enter into the Paisa structure, often without really choosing to do so. That structure includes four levels of elected leadership, former inmates say, who respond to conflicts among inmates and bring complaints to prison authorities. For better or worse, the system works to maintain order. “You respect them, they respect you,” said Garza. According to two inmates, Paisa leaders had been considering a major protest for nearly a year, since the deaths of two prisoners in early 2014. Records obtained from the federal government confirm one death in March and another in April 2014. Another Willacy inmate had died in September 2013. All three men were finishing sentences for illegal reentry. Prisoners told me that the deaths raised anxieties about what they already perceived as indifference on the part of the prison doctor and overall lags in medical care. Half a dozen officers and former medical personnel defended the prison’s medical-care practices, arguing that the medical care—which cost the inmates a few dollars out of their commissary account for each visit—was better than anything the men likely received outside the prison gates. But other officers said that the prisoners regularly complained about long delays in the medical unit and inadequate treatment of serious conditions. Three former officers described an informal rule for prisoner medical complaints that, in one officer’s words, held that “If they are not dead and they’re breathing, it can wait till morning.” Several officers told stories about their struggles to convince medical staff to pay attention to seriously ill patients in their units. “For everything, they would give them Ibuprofen,” said another officer. Following a year of growing anxiety about medical care, Paisa leaders finally called for the work strike after one of the Paisa representatives hurt his foot in the recreation yard and faced a typically long wait for medical care, guards and inmates say. The vast majority of the inmates—2,000 of the 2,800 people held in Willacy that day—slept in 10 oval-shaped Kevlar tents, lined up on either side of a 600-foot-long lane that prisoners and officers call “the bowling alley.” Each tent, Alpha through Juliet, houses 200 men in bunk beds. Four dorms located inside a hard-walled structure behind the tents hold at least another 200 men each. There are about 300 solitary-confinement cells. When the prison is at or above capacity, two prison employees told me, these solitary cells are often completely filled—not with inmates having discipline problems but with people who simply cannot fit in the open units. At the time of the riot, about 75 men were held in solitary, prison personnel said. Around 10 am, the officers began ordering the inmates in each tent to “rack up” beside their beds so that prison officials could account for each inmate. Inmates in the first four tents, Alpha through Delta, quickly complied. But the men inside the fifth tent, Echo, refused. Salazar assembled a “disturbance-control team” of six to eight officers, dressed in riot gear and carrying tear gas canisters, plastic handcuffs, guns loaded with rubber bullets, and BB-filled grenades called “hornets’ nests.” Officers say it was an act of “intimidation.” “We just show them [the disturbance team] to show them we mean business,” said an officer who watched the events. The disturbance team had been called in numerous times in the previous years, when inmates protested over prison conditions. They rarely acted. At the front of the disturbance team that day was Daniel Leyva, the head of Willacy’s Special Investigations Services unit, which was responsible for keeping tabs on gangs and illicit activity by staff and inmates. Several officers and inmates I interviewed told me Leyva was widely despised inside of Willacy. Officers said that he could be aggressive and demeaning to staff. One officer claimed that he made disparaging remarks to women about their physical appearance. Another told a story about being summarily accused of illicit behavior. Salazar moved on to the next pod: Fox. Two disturbance-control teams waited in the “bowling alley,” and the officers could see several inmates peering out the window with their faces covered in towels. Several Willacy employees pointed to this detail as proof that the riot was planned. But like many other prison staff, an officer present at the time characterized the inmates as “prepared” because they saw the team approach in riot gear and knew they would not comply with the order to rack up. Less than two minutes later, according to an officer watching, Leyva tossed a hornets’-nest grenade into the tent. The men in Fox pod scattered as the bomb exploded, some lifting the mattresses off their beds to protect themselves. Leyva signaled to one of the eight-member teams positioned behind him to rush in. The disturbance-control officers, an officer with a video camera, and several ranking officers burst into the pod, throwing at least two more grenades, and at least one canister of tear gas. Inside, the team began yelling at the inmates to “get down.” Many of the prisoners dropped to the floor, some writhing in pain from the careening pellets, while others began running toward the doors on the opposite side of the pod. When the door would not open, they used small blades broken from prison-issue shaving razors to cut gashes through the Kevlar walls. Officers told me that these blades were often found tucked beneath inmates’ mattresses, and were used to make crafts out of snack wrappers—or to cut holes in the Kevlar to store contraband. But those present describe a nonviolent, if tense, standoff that erupted into a riot only after Leyva’s escalation. As the prisoners ran toward the doors inside and began cutting through the walls, officers shot rubber bullets. Several inmates grabbed broom and mop sticks and threw them at members of the team. One inmate who was lying on the floor yelled to the officers to “let me out.” An officer responded by shooting him inside the pod with a rubber bullet, according to another officer. In less than 5 minutes, the officers say, most of the inmates had escaped into the gated area between the Fox and Delta tents. Fewer than 20 inmates remained inside, all prostrate on the floor. Outside Fox, hundreds of inmates gathered. Some were screaming. Others were throwing rocks and pipes, which they’d broken off of the fences, through the tent’s open door and at the officers. Still more retreated to the recreation yards behind the tents, wanting to be as far as possible from the chaos. Several disturbance-control team members shot rubber bullets at the inmates through the opening, as others cut a hole of their own that the team slipped through to return to the bowling alley. As officers and other staff retreated from the scene, they continued to shoot hornets’ nests over the fences that separated the Kevlar pods from the bowling alley. 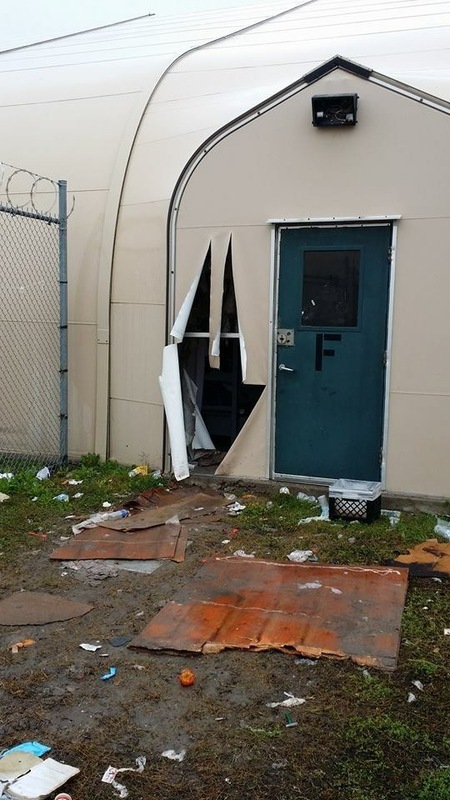 Inmates soon broke down the fences and the men in the more permanent housing smashed those doors as well. They freed the men in solitary and smashed televisions and refrigerators. From outside, onlookers could see plumes of smoke rising from the dorms. Five inmates and two officers were treated inside the facility for minor injuries after the riot, according to MTC spokesperson Issa Arnita. At least one officer’s injury was caused by a rubber bullet shot by another guard, according to former prison staff. The inmates I spoke with say that their fellow prisoners were covered in welts. One officer saw an inmate whose front teeth had been knocked out. 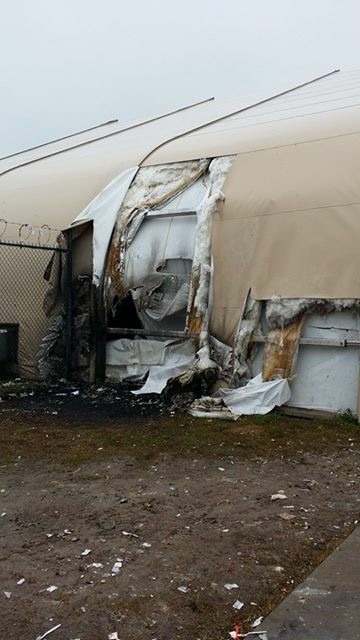 Another says an inmate had a bleeding wound on his leg from the hornets’ nest explosion. Prison officials did not reenter the areas where inmates were held until all prisoners had been transferred a week later. 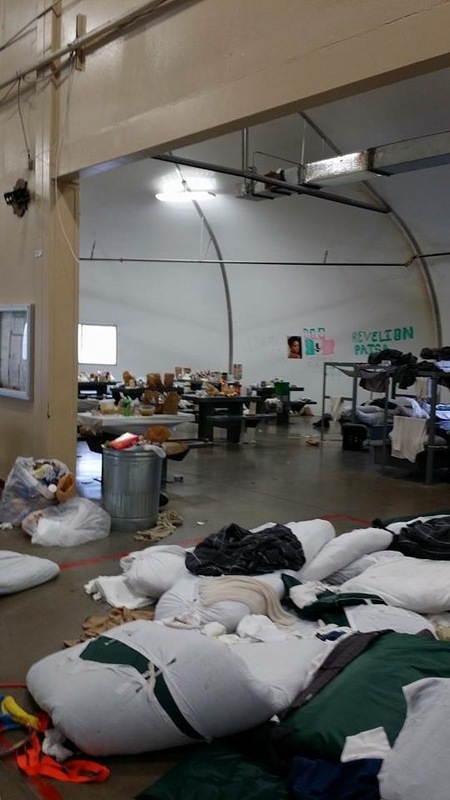 Video and photos that a former officer shot days after the riot, and provided to me, show signs that order emerged in the facility once prison staff were pushed out: trash stacked in piles and food organized in rows. “Please keep clean. For the good of everyone,” an inmate wrote on a wall. Graffiti scrawled on the side of one of the dorms sums up the inmates’ feelings about the violence: “Todo Por Tu Culpa Leiva”—All Your Fault, Leyva. Inside Willacy County Correctional Center. None of the prison staff I interviewed said that inmates had acted violently before being provoked by Leyva’s grenade. Several former Willacy staff told me that they believed the decision to use such extreme force was a simple power play on the part of Leyva and the new major, Salazar. Daniel Leyva did not accept several invitations to speak with me about the riot, but said by e-mail, “I ran my office with integrity and professionalism and whatever was said I’m sure it was said by people that hold a grudge and did not like the outcome of the results from my investigations into corruption.” According to officers, Salazar still works for Management & Training Corp. He did not reply to a Facebook message or answer repeated calls to a listed number. Inmates, who’d been told that they would be moved to other prisons, say that any complaints about medical care were made moot. “Medical care wasn’t an issue anymore—we were leaving,” said Ricardo Quintana, the former prisoner who has been deported. It took a week to move the last of the men to other BOP facilities. Bureau of Prisons spokesperson Ed Ross said that the agency has yet to complete an “after-action report.” And he said the agency would not comment on the “cause of the incident, or what may have precipitated any use of force undertaken by the contractor.” Ross referred me to MTC instead—a stance consistent with the federal government’s hands-off relationship to the growing number of noncitizens it incarcerates. “It’s MTC’s facility. From our perspective, we just had a contract with them,” Ross said.